Let’s talk about sand wedge design and how it can help you with your bunker play. The thing we need to notice about a sand wedge, and its unique to all your other clubs, is called bounce. If I look at the sand wedge end on so this way a sand wedge, here’s the shaft there’s the clubface. The flange in the sole of club kind of looks like that. Ok so there’s the leading edge of the club this part sits lower than the leading edge. So this situation when a club comes down into the sand because the trailing edge of the flange here strikes the sand first it tends to allow the club to glide through the sand, as opposed to digging in the sand. A typical iron is going to be more like this with minimal bounce. With a sand wedge, the leading edge sit up off the ground allowing the club to slide through the sand. We need to utilize this in order to effectively get the most out of our sand wedge. 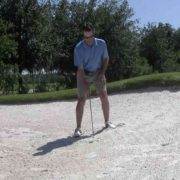 Now, what you’ll notice when we set up with a sand wedge, it has normally 10 to 14 or so degrees of bounce. 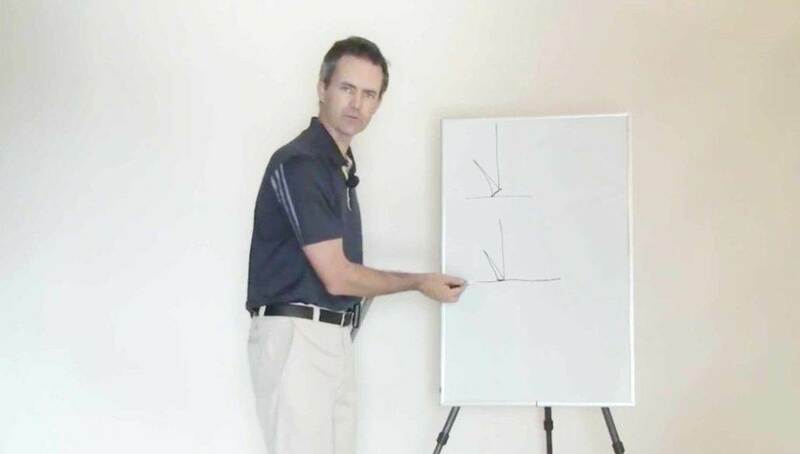 If we decide to keep everything constant and open the clubface, this leading-edge that sits up off the ground. When the club face is open, there is in fact more bounce on the club then there was when the club with square. So, the more bounce we have the less likely the club is going to be to digging into the sand. This is very helpful in softer sand conditions. If we set up with appropriate bounce and we hit into the sand a little bit too far behind the ball, the club glides through the sand, and pops the ball up and out. If we hit too close to the ball, of course the ball pops up and out. We’ve got a nice wide margin of error. 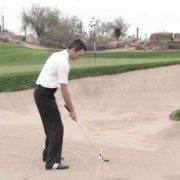 If we go into a bunker with the sand wedge set up incorrectly, the club will tend to dig into the sand. If we hit too far behind the ball, the club will dig down into the sand. 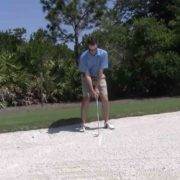 Sand will slow the club down too much and the ball will either stay in the bunker or fall short of your target. Then you start thinking, I’ve got to hit closer to the ball…and every now and then you’re going to blade one across green. Your margin for error is very narrow when the club is set up to dig. We need to look at our lie in the bunker first. If the sand is soft, we need more bounce. If the sand is firm, we need less bounce. A ton of bounce in firm sand will also cause problems. 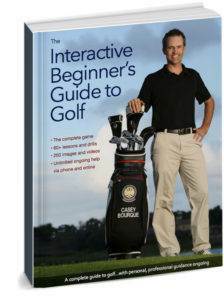 The leading edge will hit the ball and you’ll blade it out of the bunker. So firm sand, less bounce. Soft sand, more bounce. You’ll have a lot more margin for error. Try it in your practice. Open the club face such that the grooves of the club are pointed at your left toe or even further. Try to hit some shots where the club feels like it’s sliding through the sand. There shouldn’t be so much resistance when the club enters the sand. I think you’ll see some improved results out of the bunkers Good luck with your game!